U2 > News > So that was Dublin, 2009. 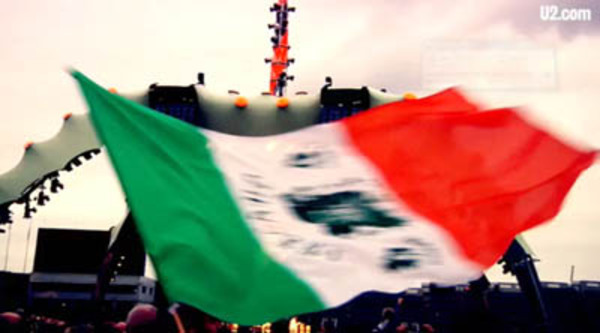 Three great shows in four night at Croke Park and this new clip captures the vibe. Were you there ? How was the weekend for you ? Stand-out moments? Surprises? And, apart from the shows, what was your best memory of the weekend ? I travelled with family and friends from Salt Lake City, Utah, USA to see U2 in Dublin - - a long time dream. Saw the July 24 show and it was amazing. I was so moved when "Bad" was played. Thank you for making my dream a reality. See you in Vegas. I'm just amazed at how many people here were from other parts of the world and how many have commented that it was a dream come true to see U2 play in Dublin! How incredible. This was my dream as well (I've been a fan since the very early days) and so I travelled from Yukon, Canada to see them....and wasn't disappointed. I'd seen them a couple of times before in Sydney Australia, but as I read somewhere about seeing them in Dublin "this is where they need to be seen". If I ever have the chance to do it again I will. I was thrilled to see a Vancouver show added to the tour, so managed to get a ticket to that and look forward eagerly to seeing them again on this tour. To the band....thank you for being a shining light in an often challenging world. God does speak through your music. I saw the band a lot of times since 1993 but it was my first time in Dublin. I saw the 3 shows. The first one was incredible. The seconde very good and the last one very emotional. Thans to the band, I will never forget!!!! Greetings from Belgium and I hope to come back in the summer for three more shows with a second European leg. Now I can die a happy man! Flew to dublin fri mornin , most people on flight going to se U2 , any age, went to 360 sat nite & also got tickets for Mon, what an experience, not seen U2 for 22yrs, only at Brits this year in Feb, had an amazin time, people so friendly in Dublin, pubs all geared up for us U2 fans excellent!! just booked for Wembley and tickets for Sheffield in August, cannot get enough of this band, they are and always will be the best band in the world ever !!!!! I sang my head off to them all, boys don't leave it too long before you come back, made my summer !!!! My wife and I took a long, wonderful journey from Mississippi, USA to Dublin, Ireland to see the band at Croke Park on July 29th. This was to celebrate our 15th wedding anniversary! We were there right in front!! Ten feet from the outer stage walkway and just a few feet from the band! Oh, the fun we had and will always remember!!! Thanks so much for a wonderful memory we will always cherish! I come from France to see the friday's and saturday's show. Beautiful moment for mysterious ways, full of emotions for bad. Dublin become U2 land like 4 years ago. Amazing. See you in 4 years guys, i will be here again with my friends. Dreams become sometimes true: i had the luck to see Bono very close going out from a pub in Dalkey. Thanks for all this magic moments. My family and I had the privilege of spending 8 days in Ireland, capped off by the Monday show, before flying home to California. We justed wanted to say Thanks to all of our Irish hosts. EVERYONE, EVERY ONE of you from the B&B owners, the workers in cafes, pubs, and tourist stops, the warm and welcoming staff at the Ritz, and the great cabbies in Dublin made our experience very rich. Also, playing witness to all the performances by musicians and artists we enjoyed along the way, especially the little combo from the north side of Dublin, truly was a privilege. You, your culture, and your country are amazing. Cheers! to all of you. Unforgettable Journey!!! I went in Dublin on 23 July, saw 3 great concert's in the pitch and heard my favorite song 2 times (BAD). So...there are no words to describe so many emotions. See U2 in Dublin is really MAGNIFICENT. I will follow U2. From Mexico to see the 3 shows! My trip from Mexico just to see the 3 shows was worth it! What an experience! Like Bono said, Ireland is where its at! Me and my friend came from Croatia to see U2 in Dublin! Words can´t express the feeling... something I will remeber all my life! Peace to u all! My husband and I flew from Dallas TX to Dublin to check out the show. The vibe as incredible. The people were amazing and the show was awesome. 80 thousand people...wow what a once in a lifetime experience and all for U2!! For me it was the Crazy remix - not my favourite song on the new album but it blew me away so much on Friday night i couldn't wait to go back hear it again on Saturday - mind blowing and a very brave step by the band - top marks. I enjoyed Friday's night show that little bit more just due to the play list - but both nights were special to me! For the fourth time in Ireland and this time we also visited Londonderry where we saw were Bloody Sunday had taken place, heard the stories and visited the small museum. Now we fully understand where the U2 song is about and to see it performed live by U2 and 80000 fans in Croke Park, was awesome. Dublin is always a magic city, but being there while U2 is in town, is unforgettable! I've seen the Lads a couple of times but that was the best by Far! The stage is just mind blowing in fact I took three U2 virgins and they were totally blown away! We all went to Dicey megraws after (by the way the best bar in Dub, thanks for hospitality!) Everyone from every corner of the world had massive smile on there face! Brilliant! It's was so good we've all booked up to see you again at Wembley can't wait!! Flew in from NYC on Thursday and met my friend who is now living in Cork. We saw our first U2 show together when we were in college on The Joshua Tree tour, so it was a treat to see U2 in their hometown together and feel like we were 19 again. I knew they would play "Bad" and can't begin to explain how excited I was when I heard them launching into it on Friday night. And since I remember the days of ending the show with everyone chanting "How long to sing this song?" at the end of a show, I was excited to hear "40" mixed in. My friend's highlight was Saturday night - "I Still Haven't Found What I'm Looking For." And of course, no U2 show is complete without "Sunday, Bloody Sunday" which rocked both nights. Also loved the new stuff, particularly "Breathe" and "Unknown Caller." We were in the Pitch for both shows, and amazed by the The Claw, Croke Park and just being in Dublin for the shows. Followed up the concerts with 5 days of traveling around Ireland - beautiful country and fantastic people. Counting the days until Sept 24 at Giant's Stadium in NJ. WendyAnne and I were there for the Friday night show and we thought it was FANTASTIC! I just got back from Dublin! I have never seen a U2 concert even though they are my favorite band. I wanted my first U2 concert to be in their hometown, Dublin. It was worth the wait. They are truly the best band in the world, bar none. Croke Park, U2, Dublin and Ireland, what an experience. Thanks to all my new Irish friends. Your country is spectacular but your most valuable resource is your people. I have never been to a more friendly place. best conerts yet..my girlfiends first concert and my younger brothers first u2 concert! me and my mates were in the upper tier and my brother was in the lower tier at the oppsite side of the stadium (bummer) but we managed to sneak him into the same tier as us!!!wahooo! !and to top it off there was an empty seat beside our four seats....worked out perfect...what a weekend!!! Ireland ist great, friendly people and the best concert that we ever seen!! Friday at Croke Park - unforgettable! Since over 20 years U2 is part of our lives. Now the first time in Dublin. We loved it an our son, 13, was with us. Thank you all! "Look what we brought home"
......and they sure did!!! !.........U2 remain awesome.......their energy was unbelievable and contagious........I LOVE U2!!!!! Still on a high after three amazing shows in Croke Park - all different and unique and difficult to say which one was best - best set list Friday, best performance Saturday best atmosphere Monday. 6+ hours of extreme sensory overload guaranteed to thrill!!! I went to friday, saturday and monday shows , coming from France to see them at home. Friday's set list was very good , to hear "Bad" and "UTEOTW" live was my dream and it became true. I will never forget this magnificent trip in Ireland. My wife and I had the ultimate experience in Ireland - seeing U2 on her birthday (Friday, July 24) and then again on my birthday (Saturday, July 25)! A Magnificent time both at the concerts and around Dublin. For a life-long fan, words cannot describe the joy of seeing the boys play their home town. Thanks U2.com for helping make this possible! seen every tour since joshua tree and the boys get better and better.fulfilled a dream seeing them play croker.the saturday show was spellbinding and dublin was electric all weekend.thank for the amazing memories i will always cherish.see you in sheffield and please play bad. What a weekend that was in Croker ! Friday night in the Upper Deck of Hogan stand taking in the enire show and The Claw. Saturday night up the front of main crowd on the pitch and Monday night in The Pit !! The Pit was the highlight, being so close to the Band. Also, hearing the lads tune up that afternoon was fab, playing songs that didnt feature any night. I will Follow, Drowning Man, Electrical Storm. Come back soon - indoors at the O2 Arena ? ?